At FLX Fitclub, we feature world-class fitness programs designed and produced by the team at Les Mills International. These classes are created by experts to give you amazing results (scientifically proven!) while ensuring you stay safe. Our instructor team has years of expertise & training, awesome coaching & motivational skills, and deep libraries of music & material that allow us to keep every class fresh and fun. Over time you’ll get to know the basic format to expect from a class, yet each & every class will be a unique experience. To sign up for any of our great classes, check the Class Schedule. Or if you’d like to learn more about them before you decide what to try, read on! 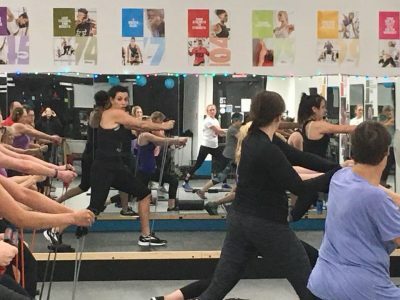 BODYATTACK™ is a high-energy fitness class that combines athletic movements like running, lunging and jumping with strength exercises such as push-ups and squats. You’ll burn tons of calories and improve your strength, coordination and agility, leaving you with an endorphin high! 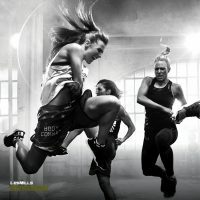 BODYCOMBAT™ is a high-energy martial arts-inspired workout that is totally non-contact. Punch and kick your way to fitness while learning moves from Karate, Taekwondo, Boxing, Muay Thai, Capoeira and Kung Fu. Release stress, have a blast and feel like a champ! BODYFLOW™ blends elements of yoga, Tai Chi and Pilates to benefit both body and mind. Simple moves set to great music, with options for all levels, will improve your strength, balance and flexibility. You’ll leave the class feeling calm, centered and ready to take on the world! BODYPUMP™ is the original barbell-based strength training class that gets you lean, toned and fit – fast. You’ll work all your major muscle groups using light to moderate weights with lots of repetitions. Leave the class feeling challenged and motivated, and ready to come back for more. 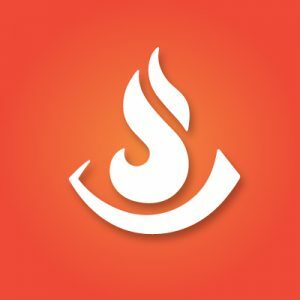 It’s our most popular class for a reason! BODYSTEP™ is a full-body cardio workout that will tone your lower body like nothing else. You’ll start with basic stepping, and gradually challenge your brain and coordination with faster stepping and the chance to test your rhythm and flair. Some classes incorporate moves like burpees, push ups and weight plate exercises to work the upper body as well. You (and your legs) will love it! 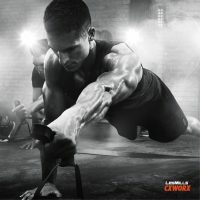 CXWORX™ strengthens all the muscles in and around your body’s core. A stronger core makes you better at all the other things you do, from activities of everyday life to your favorite sports. It’s the glue that holds everything together! And since it’s just 30 minutes long, it’s the perfect workout when you’re pressed for time (or a great add-on to another class). 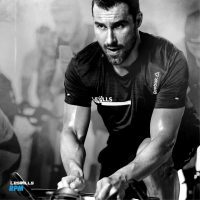 RPM™ is 45 minutes of high-energy cardio interval-based indoor cycling. You’ll draw on the energy of the group and the rhythm of the music through a journey of hill climbs, speedwork and power training. You’re in control of your own resistance levels and speed, so you can build up your fitness level over time. It’s a low-impact cardio workout that burns lots of calories, improves your aerobic fitness and gives you a feeling of personal achievement! SH’BAM™ is a fun-loving, ego-free cardio dance workout – no dance experience required. We turn on the party lights to create a club-like atmosphere and allow you to immerse yourself in the experience. You’ll gain some hot new moves as you burn some calories! It’s mashup time! 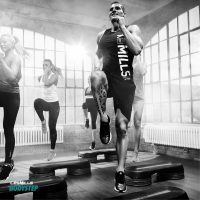 We’ve combined fun, energetic cardio tracks from BODYATTACK™ and core strength training from CXWORX™, with lots of options to dial the intensity up or down. It’s everything you need to burn calories and improve your functional fitness in just 45 minutes! FLX Cycle is our signature indoor cycling class, with an energetic mix of hit music that helps push you through a full 60-minute class. 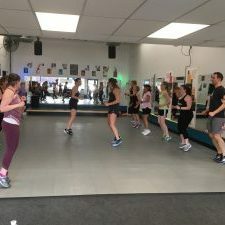 You’ll get a challenging blend of interval training, strength, speed and endurance work (and maybe a little bit of dance party). Leave sweaty and satisfied, with a smile on your face!